As I'm traveling more and more frequently, I've come to appreciate the necessity of owning high quality luggage that can get me from point A to B and all the way to point X with seamless ease. I'm an over-packer which means everything but the kitchen sink comes with me. A weekend getaway inevitably requires ten outfits and ten pairs of matching shoes along with a plethora of unnecessaries. Therefore, when shopping for luggage, space, stretchiness and durability are on the top of my list. Since I sometimes travel solo on business trips, lightweight pieces are also a must. But I must confess, I almost never do any heavy lifting as a chivalrous fellow passenger always comes to my aid when I put on my damsel in distress look. Sometimes, it's definitely great to be a girl! And lastly, I'm only into cute luggage. Yeah, I'm shallow like that. Louis Vuitton Montsouris Backpack GM. It's large, durable (can hold up to 200 lbs), frees up my hands completely and doesn't place undue pressure and weight on my shoulders. This one's pretty amazing well. Louis Vuitton Alize 24 Heures. I usually use this bag to store electronics, food and books. The size and roominess make it an idea carry on piece. 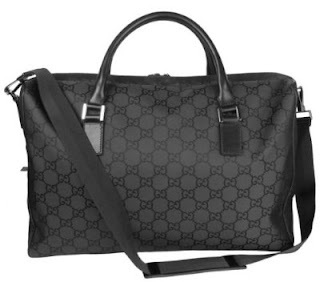 Gucci Duffel Bag. I use this as either a carry on or check in bag depending on need. It folds up which means it can be used as a "I shopped way too much on my trip and need additional luggage to lug everything home" duffel. Briggs and Riley Transcend 200 Expandable. This is the frequent traveler's brand of choice as all Briggs and Riley luggage come with the most amazing warranty. The Transcend collection is ultra light weight but heavily durable. Briggs and Riley Baseline. Ballistic nylon. Heavy duty. Lifetime warranty. Enough said. And of course, what's a trip without a fanny pack? To be perfectly honest, I sometimes rock my pack even when I'm not travelling. I also love this one! OMG! The first one, is totaly amazing!!! Good quality luggage is so important - I've broken two suitcases now (overstuffed and the extendable handle bent from the weight and got jammed) so I'm definitely investing is something better this time round! I ♥ LV! Me encanttttttttttta! Love the backpack!!! I want it! this web is exactly what I'm searching for! . I'll also share with my friends. Thanks again! Love these bags. A slightly match to my limo. Off course Its very beautiful and stylish bags I like it thanks for sharing. In our Wholesale Oakley Sunglasses Shop, we stock over 700 pairs of sunglasses for men and women,they are all high quality of Discount Oakley Sunglasses,with its high reputation,Oakley Sunglasses For Men sells hot in the resent years. As you mention that you have good experience of travel in different locations in the world. I am sure that you must know the importance of Reading taxi. We are providing services in UK of Reading taxis on Airport. traveling is my hobby.its my pleasure to know different people by traveling. travel is not only recreation but it also a way to gather knowledge. Book luxury Hotels in Delhi for making your trip memorable and luxurious. These hotels are having all the modern hotel facilities and their well experienced staff treat you as a king. Bangladesh is a great place to visit, especially at a discount! I've been there once before and I absolutely loved it! . It has numerous sources of natural beauty, marvelous places and sceneries. travel is the mental refreshment of human. so every one must be travel in anywhere in the world. Buy Cheap Moncler Online At Moncler Jackets Outlet Store,Free Shipping! Welcome to our Cheap Moncler Outlet online boutique. We offer more remise Moncler jackets with unbelievable prices and amazing customer services here. travel tours, tourism, sea beach is main part of the life. so always go out side for travel. Der Artikel ist sehr gut, ich mag es sehr much.Here Ich habe viel gelernt, dann werde ich mehr Aufmerksamkeit zu bezahlen. For refreshment traveling is one of the most widely used ways. So everyone should plan traveling once or twice a year. it is best page for travel . you get here about travel news. travel tours, tourism, sea beach is main part of the whole life. so always go out side for travel. For refresh travel is one of the most widely used ways. So everyone should plan traveling once or twice a year. travel Code is independently owned and operated by Travelzoo (Asia) Ltd. and Travelzoo Japan K.K. under a license agreement with Travelzoo Inc. Thank you very much for sharing this, I'll definitely keep this in mind in my next travel. Lv3hreeshaowen louis vuitton are usually the most used manufacturer which can be reviewed between a lot of the females. Although the particular substance is indeed expensive, the particular substance with the Louis Vuitton handbags will be resilient and also expensive. The particular high demand louis vuitton outlet are employed simply by several could in lots of superstars. Today per day you will find louis vuitton which can be specifically any replicate with the authentic artist totes. louis vuitton bags employed the most effective components, special and also stylish type. The particular vintage louis vuitton handbags deliver any size regarding type, and also new models can be obtained there is much surprise at the same time. louis vuitton outlet from the artist tag Louis Vuitton continues to be proven to help make high-class basics for each and every celebration and also type. Louis Vuitton Totes can be a reliable and also popular identify inside artist brands. The particular adequate verity regarding layout and also elegant substance allures everybody. The style regarding Louis Vuitton 2012 will be obtained significantly reputation because sophistication and also type. Bags are amazing. I love to have this type of stylish bag. travel is the mental refreshment. every ones need to go to travelling for mental refreshment. Travel is important for everybody. You can get knowledge by traveling.But it is difficult to carry your goods it you have no suitable bag. Here you can get all kind of travel bag. Travel Bangladesh is a tour operator & tourism information power house specialized in travel and expeditions in Bangladesh. It is located in the heart of Bangladesh in the city of Dhaka, the capital of the Bangladesh. This specific location gives us two advantages. I can’t avoid having excess luggage when I travel due to the nature of my work. I don’t like buying expensive luggage bags like these but I think I should try buying one because we all know that these are good enough to last a long time. As I'm travelling more and more frequently, I've come to appreciate the necessity of owning high quality luggage that can get me from point A to B and all the way to point X with seamless ease. I'm an over-packer which means everything but the kitchen sink comes with me. What a wonderful idea! That’s a perfect way to honor your children and have a beautiful design as well. I’m really interested in hearing how much the design of the star means to people. This is a very helpful post, I was looking for this information. Just so you know I located your site when I was doing research for blogs like mine, so please check out my site sometime and leave me a comment to let me know what you think. Fantastic post from you, man. I have keep in mind your stuff previous to and you’re simply extremely excellent. I really like what you’ve bought right here, really like what you are stating and the best way by which you assert it. You make it enjoyable and you continue to care for to stay it smart. I cant wait to learn far more from you. This is really a terrific website. Really a great article. You have a very informative blog post here and I just wanted to comment & thank you for posting this. I’ve bookmarked your blog and I’ll be back to read more in the future my friend! Also nice colors on the layout, it’s really easy on the eyes. For refresh travel is one of the most widely used ways. So everyone should plan traveling once or twice a year. Bags are amazing. Travel Backpacks are now a necessity! All the bags mentioned above are so mind blowing!